I want to thank Lord Rothschild and Mr. Gianpaolo for being so generous and hosting this dinner. I also want to take this opportunity to warmly welcome the Chinese entrepreneurs and financiers. They have traveled a long way from China to be with us this evening. 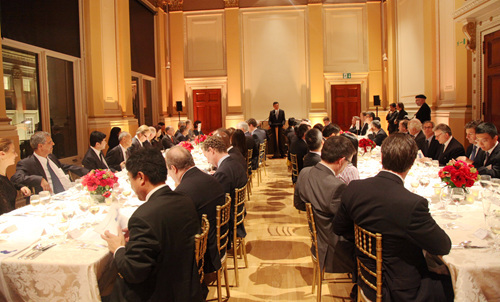 Tonight business leaders from China and Britain meet and dine together. Tomorrow, you will join together again in Waddesdon Manor. There will be time for in depth discussions to explore business opportunities and cooperation. I wish your meeting tomorrow a great success. Autumn is regarded as season of harvest both in China and in Britain. 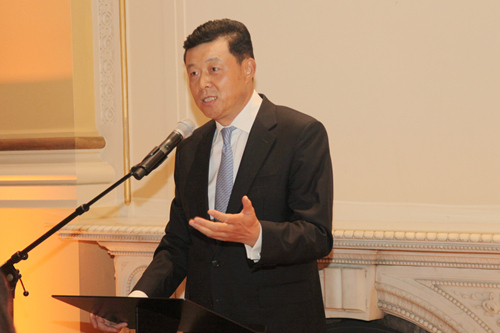 As we step into October, we have already reaped a bumper harvest during 2013 for China-UK relations. Here are the reasons. First, the advance of China-UK economic cooperation is amazing. From January to September, our bilateral trade continued to grow against all odds and reached 49.4 billion US dollars. This was an increase of 5.7% than the same period last year. UK is currently China’s third largest trading partner in the EU. China is Britain’s second largest trading partner outside of EU, only second to the United States. More heartening than trade figures is Chinese investment in Britain. The UK has become the top destination for Chinese investments among all EU members. In the past one and a half years Chinese investments exceeded the total of the previous three decades. Since the beginning of this year there has been a surge of project investment. Chinese companies have invested, or are planning to invest, in more than 10 big projects in Britain worth nearly 5 billion US dollars. These projects cover a wide range of areas, such as infrastructure, real estate and car making. In the energy sector businesses of our two countries are exploring investment and cooperation opportunities in oil and gas, nuclear power and offshore wind farms. Our two governments have signed a series of agreements for energy collaboration. In the financial sector, recently China and Britain signed a currency swap agreement worth 20 billion pounds. This will further facilitate trade and investment between our two countries. Now, turning to the second reason. · And enhancing financial cooperation. The two sides agreed to work together to promote a forward-looking, mutually beneficial and growth-oriented China-UK economic and financial relationship. I believe many of the outcomes are exciting news for business communities in both countries. The third reason is that China-UK relationship has returned to the fast track. In merely one month period since late September, the British Energy Secretary, the Chancellor of the Exchequer, the Mayor of Greater London and the Secretary for Transport have visited China. There will be more and higher level visits in the months to come. Right now, both the Chinese and British economies are at a critical juncture. We both aim at stable growth, economic restructuring and delivering a better life for the people. In this context, driving forward China-UK relations and stepping up bilateral cooperation is of pivotal importance. It reflects the aspirations of political leaders and the general public in both countries. It answers the call of our entrepreneurs. It serves the fundamental interests of our two countries. A China-UK relationship based on mutual respect and shared benefits will enjoy healthy, stable and sustainable development. A China-UK relationship as such will provide a strong support and firm guarantee for bilateral cooperation in many areas. It also offers an ample stage for all of you to bring your abilities into full play. For all these three reasons, this seminar organized by Lord Rothschild and Pi Capital could not be more fitting and better timed. I do hope that you have in-depth exchange of views on a wide range of topics. I also hope that your cooperation will lead to more fruitful China-UK business links and greater advances in China-UK relations.